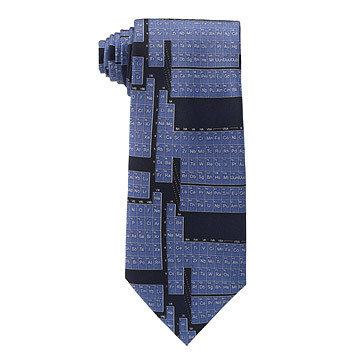 For the science geek in you, this fun tie features the periodic table of elements. This fun tie (not to be confused with Ti: Titanium) is sure to cause a positive reaction in any science geek. Emblazoned with the Periodic Table of Elements in a soothing suite of blues, it adds a bit of good-natured, nerdy flair to any otherwise buttoned-up ensemble. Silk and polyester. Made in New York. Designed by Josh Bach. I wish Uncommon Goods would carry more ties for more occupations and professions. My husband wore this with a navy dress shirt and a grey vest. The combo looked very professional and dapper. He received multiple compliments and was very happy with how he looked and the style of the tie. He's a science teacher, so this was perfect for him. As soon as my son saw it (he's 12) he asked if he could have one too! This was a great present for my husband. He wanted a creative tie, but not one that could cause others to label him as immature (as many science themed ties tend to do). Great quality and great product! I saw this tie and just LOVED it. I have a friend who is a nuclear engineer and I knew he would appreciate the humor in it. I bought it for him for his birthday. I was disappointed when I received it, because it was an expensive tie, and the quality of it was very lacking. I still like the idea of it and I know my friend will get a good laugh, but is so cheap looking he will not actually be able to wear it to work. Plus it looks like I didn't spend a whole lot on it (even though I did), so I will have to get him an additional birthday gift. My husband wears ties to work on "Tie Tuesday" - he has several I have purchased him from Uncommon Goods. He really likes the way they blend science and technology with fashion - much more fun than stripes or paisley! Thsi tie is a great conversation starter!